Since I’m working from home now, it turns out I end up spending a lot of the day basically Velcro’d to my couch. My social life is pretty sparse, since I’m not a big drinker and I’m trying to drop some weight, which makes me not too much of a big eater, right now, either. That means that my only real excursions are rather boring – trips to the gym, grocery store, and the occasional coffee shop. Thus, it seems like a good idea to start inventing reasons to get the hell out of the house, so as to prevent (or at least slightly impede) my gradual decent into madness. Which leads me to my new project: taking photos around the neighborhood. I have a DSLR that I’m trying to learn to use, and even on ‘auto’ (which yes, I know makes me one of those people) it takes decent shots. I’ve signed up for some classes, starting in early November, but until then I’m not going to shelf my camera and wait to become learned before trying to capture a piece of everything I see and love. 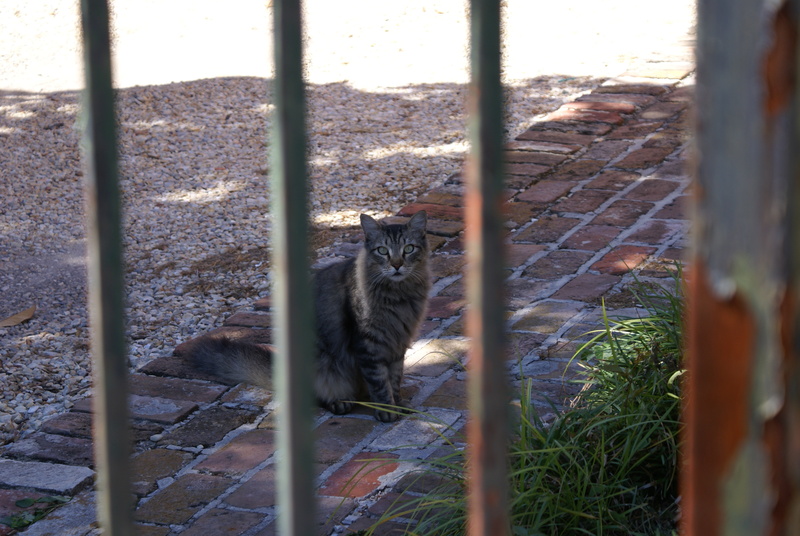 I typically take photos of architectural details, but the other day I saw a number of cats out in people’s gardens around the Lower Garden District. Here are a few who were kind enough to pose for me. 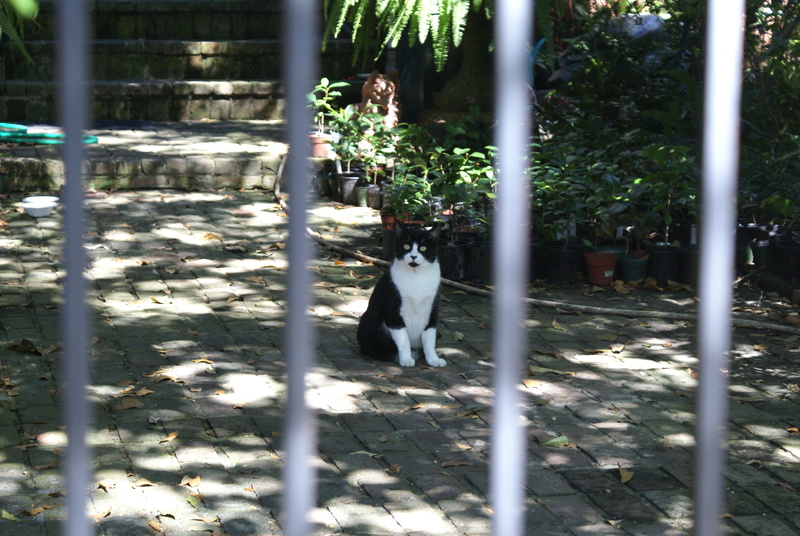 I guess you could also call this series ‘Cats Behind Bars’! 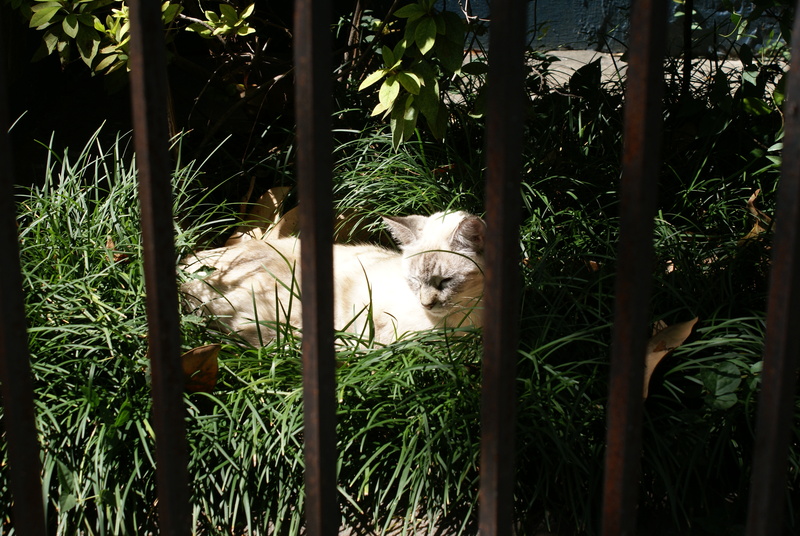 “Cats Behind Bars” sounds like really good reality TV. There would have to be a lot of creative editing (due to nap times), but I’m sure scenes from the cat prison cafeteria would always be interesting.